The Faculty of Land and Food Systems (formerly the Faculty of Agricultural Sciences, and Faculty of Agriculture) has a proud record of achievement at The University of British Columbia, being one of the three founding Faculties. The story begins in 1908 when the BC legislature passed a new "University Act" establishing "The University of British Columbia". In 1910, after a province-wide survey, Point Grey near Vancouver was selected as the site of the UBC campus. Construction of first permanent buildings at Point Grey began the following year, but the outbreak of the First World War halted the clearing and building work. According to the UBC archives, one of the first UBC persons affected by the war was Librarian J T Gerould, hired to purchase books in Europe. He was arrested as a spy in Leipzig, Germany, when the war started, the incriminating "evidence" being a copy of the UBC site plan in his baggage! 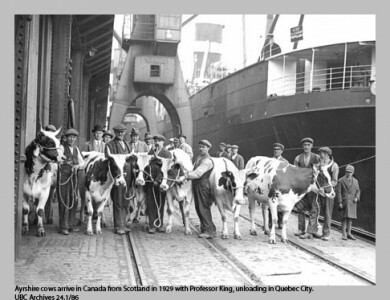 In 1914, Dr L S Klinck, Professor of Cereal Husbandry at Macdonald College, McGill University, was appointed as UBC's first Dean of Agriculture. During UBC's first two sessions Dr Klinck taught a general course in agriculture, which was open to 3rd and 4th year Arts students. In 1915 the University opened in temporary headquarters at the former McGill University College of British Columbia facilities (nicknamed the "Fairview shacks" after the surrounding neighbourhood) adjacent to Vancouver General Hospital. There were three faculties; Arts and Science, Applied Science, and Agriculture. Total student enrolment was 379 and full- and part-time faculty totalled 34. The first students in Agriculture were enrolled in 1917/18. By then the Faculty of Agriculture consisted of four departments: Agronomy, Animal Husbandry, Horticulture and Poultry Husbandry. Dean Klink became President in 1919 following the death of UBC's first President, Dr Wesbrook. He was succeeded as Dean by Dr F M Clement, who served in that capacity for 30 years, until 1949. The Department of Dairying was established in 1919. The return of students from war-time duty increased total enrolment to 890 for the academic year 1919-20. The "shacks" quickly become over-crowded, with classes being held in tents, churches, and Sunday schools. However, construction at Point Grey did not resume. During this period the Faculty graduated its first class in 1921, the members of the graduating class being Henry Davis, Marion Green (maiden name Mounce), Cecil Lamb, Claude Leckie, Fred McKenzie, Richard Palmer and Charles Traves. 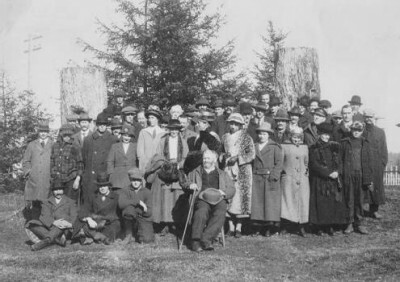 By 1922 the students were tired of the over-crowded conditions (full-time enrolment reached 1200 for 1921-22) and organized a province-wide publicity campaign to persuade the government to complete the Point Grey campus. This resulted in the "Great Trek" from downtown Vancouver to Point Grey, and the presentation of a petition with 56,000 signatures to the Speaker of the Legislature in Victoria. As a result the government authorized a $1.5 million loan to resume construction. The initial buildings at Point Grey were then completed, including the Agriculture Building, and in 1925 UBC moved to the Point Grey campus. An early emphasis in the Faculty was on extension and continuing education for urban and rural residents, and on the supply of superior stock to producers. This was in keeping with the great importance of Agriculture in the development of the Province at that time. For instance, in 1919 a Summer School for Teachers was held in Victoria High School from July 7 to August 9. It included Rural Science, an Advanced Course for those who had completed the Preliminary Course in 1914, 1915 or 1917. A later development was the introduction of the very successful Interior Program of Continuing Education which allowed a range of Faculty courses to be offered throughout the Province. The Sigma Tau Upsilon Honorary Agricultural Society was created in 1927. In 1932 the Great Depression forced a reduction in University operating grants by the provincial government. The budget was reduced from $626,000 to $250,000 and salaries also were reduced. However, students mounted a successful publicity campaign against a suggestion that the University be closed. In 1936 enrolment reached 2400 students and registration in the campus COTC (Canadian Officer Training Corps) unit doubled as the Second World War began. A total of 1680 students enlisted in the Forces. Many faculty members went on leave for special war-time duty. 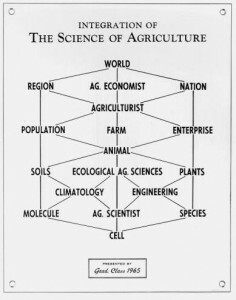 In 1940 the Department of Agricultural Economics was established. Dr. Norman A M MacKenzie was appointed in 1944 as UBC's third President. The first student residences opened that year at Acadia and Fort Camps. In 1945 the University addressed the need for post-war academic expansion. To accommodate the new programs and students, fifteen abandoned army and air force camps were dismantled and shipped to Point Grey, to serve as huts for classrooms, laboratories, and residences for both students and faculty. Total enrolment swelled to 9374 in 1947, with war veterans making up some 50 percent. The Department of Agricultural Mechanics was established that year. A new Dean, Dr Blythe Eagles, succeeded Dean F M Clement in 1949. Following his appointment the Faculty was reorganized into the departments of Agricultural Economics, Agricultural Mechanics, Animal Science, Plant Science, Poultry Science and Soil Science in 1955. In 1958 the University celebrated its "Golden Jubilee" and launched the "UBC Development Fund", the first public appeal for capital funds by any Canadian university. Donations and government contributions together raised $35 million. In 1962 Dr. John B Macdonald became UBC's fourth President. 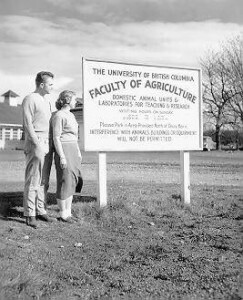 1965 was an important year for the Faculty of Agricultural Sciences. Forestry magnate H.R. MacMillan gave $3 million to expand the Library book collection. This allowed for the building of the H.R. MacMillan Building, which housed the Faculties of Agriculture, Forestry and the H.R. MacMillan Library. In later years one newly-appointed Head asked a senior colleague why the offices had such small windows. The reply given was that "Dean Eagles wanted the Faculty to concentrate on work and not be distracted by looking out the windows at the beautiful campus!" At this time the University began the largest expansion program in its history, which included building the South Campus research area. This included plant nurseries and greenhouses, and labs and housing for swine, sheep, poultry, dairy cattle and fur animals. 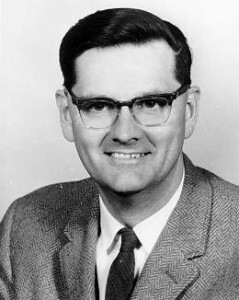 Dr Michael Shaw from the University of Saskatchewan was appointed as Dean in 1967, succeeding Dean Eagles. He served as Dean until 1975. Under his leadership the name of the Faculty was changed in 1969 to Agricultural Sciences, to reflect the now strong emphasis on science in its teaching and research programs. In addition the Department of Food Science was added. Dr Walter H. Gage appointed UBC's sixth President that year and the University completed a five-year, $71 million building program. Dr Warren Kitts, a former Head of the Department of Animal Science, became Dean of the Faculty in 1975. He continued the strong emphasis on excellence in teaching and research and himself conducted a vigorous research program. In the same year Dr Douglas T Kenny was appointed President of UBC. Dean Kitts served until 1984. A milestone was reached in 1979, with UBC awarding its 100,000th degree. Dr K George Pederson was appointed President of the University in 1983 at a time when UBC was again facing financial problems. Faced with these financial constraints, Senate voted in 1984 to limit first-year enrolment for 1984-85, and the Board of Governors raised tuition fees an average of 33%. Prof Beryl E March took over the Deanship of the Faculty on an interim basis following the retirement of Dean Kitts in 1984. One of her notable achievements as Dean was to ward off attempts to disband the Landscape Architecture group within the Faculty, on account of financial problems faced by the University. She was succeeded as Dean in 1985 by Dr James F Richards from the Department of Food Science who served as Dean until 1997. During his Deanship the School of Family and Nutritional Sciences and the UBC Botanical Gardens became part of the Faculty. President Pederson resigned in 1985 in protest against provincial government cuts in post-secondary funding and Dr. Robert H.T. Smith was appointed President pro tem. Subsequently Dr. David W. Strangway was named University President. In 1985 the Department of Agricultural Mechanics and Bio-Resource Engineering discontinued the program in Agricultural Mechanics and that part of the name was dropped. In 1986 the departments of Animal Science and Poultry Science amalgamated to form a new Department of Animal Science. "The UBC Campaign", with its theme "A World of Opportunity" was launched in 1989. Its goal was to raise $66 million in private and corporate donations, with the provincial government to provide equal matching funds, to pay for new buildings, facilities, programs, and scholarships. Overwhelmingly successful, by the time it ended in 1993 the campaign had raised a total of $262 million. The University celebrated the 75th anniversary of its opening with a series of special events in 1990, including the largest Open House in its history. During the celebrations several alumni of the Faculty of Agricultural Sciences received recognition for outstanding career achievements, including Dr Robert J Young of New York for services to Higher Education and Research, and Dr Donald R Clandinin of Alberta for services to Canadian Agriculture and Research. UBC's first woman President, Dr Martha C Piper, was appointed in 1997. That year a new Dean of Agricultural Sciences - Professor Moura Quayle from the Landscape Architecture Program - was appointed and the Faculty began a new reorganization as a non-departmentalized Faculty. In 2005, the Faculty voted overwhelmingly to rebrand itself as the Faculty of Land and Food Systems, to better reflect its expanded focus in the areas of Food Science, Nutrition, and Land, Food, and Communities. After serving as Dean pro tem for one year, Dr. Murray B. Isman was officially appointed Dean of the Faculty of Land and Food Systems in 2006. In 2009, under Dean Isman's leadership, the Faculty launched two professional masters programs in Food and Resource Economics, and Food Science. In 2013, the Faculty launched a professional master's program in Land and Water Systems (MLWS) and a new major in International Nutrition, part of the Food, Nutrition and Health undergraduate program, and the first of its kind in North America. In 2014, after nine years, Prof. Isman officially retired from his role as Dean of the Faculty of Land and Food Systems. After an extensive search, Dr. Rickey Yada was appointed to a five-year term as the new Dean of Land and Food Systems. Prof. Yada's background in Food Science (he received a BSc, MSc, and PhD from UBC), and his experience as a Professor at the University of Guelph, will be an asset to the Faculty as it approaches its centennial year in 2015.